Whitby Food - Who Knew!? I was born in Whitby, and I live in Whitby again now. In the intervening years, when not in Whitby, I missed it hugely. In part for the obvious, the sights and sounds, the harbour and history - but most notably and perhaps not predictably, for the food! Before I make a list of my recommendations, I'm going to ask the wider audience for theirs; partly for inspiration, in case I miss something obvious, but partly also in case I have spent my entire life missing out on yet another wonderful food. If you love a Whitby foodstuff, please help. Come on over to our Facebook page and see if someone has already recommended it - if so, give it a LIKE. If not, please please add it. It could be something you buy over a counter - or something you pick from a restaurant menu - anything, as long as it's food. 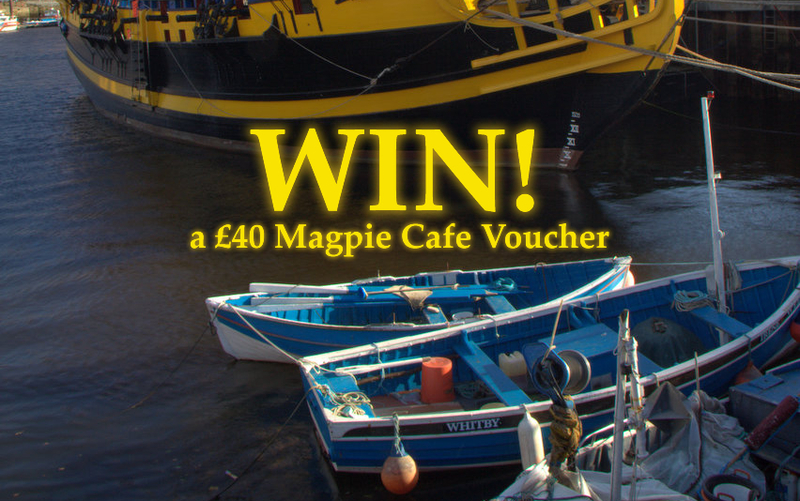 And in a food related motivational way, Whitby Online is offering a £40 Magpie Cafe voucher to one lucky eater who likes our Facebook page, recommends a Whitby food and shares our Whitby food Facebook post. We'll select one of you at random on December 21st 2015.